Black and white negative showing three men of Eric Clarke's Bugle Band practicing at the Legion Hall. Another man looks on. 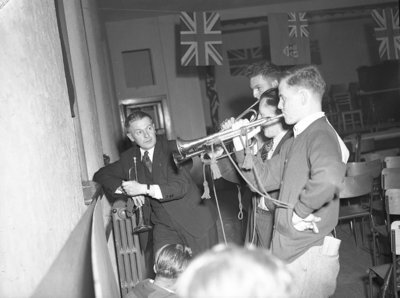 Eric Clarke's Bugle Band, 1947, Marjorie Ruddy, Whitby Archives, 18-037-002.